You may be wondering what an image of waving flags has to do with NCECA Exhibitions. Well, I’ll tell you, but first, you must promise to share this information…not just social media share (do that too), but actually TELL your friends…(or students)….in person…verbally. OK, so several years ago, exhibitions were marked with purple flags. It made it clear to conference goers where the venues/shows were. As time went by, flags went missing. Somewhere along the way, they were altogether gone (but not forgotten). But that’s not all the Exhibition news I have for you today. You may or may not have understood the designations NCECA has had for shows in years past…CIE, LGE..RSJE…NSJE…Clay National…Biennial…Invitational…..what’s it all mean????? CIE is short for “Concurrent, Independent Exhibition” and referred to shows that were proposed by an organizer or curator outside of the NCECA board and staff. All of these proposals would be looked over by the onsite liaison, the exhibitions director and one other person. This team would select high-quality shows that fit in with the conference theme and then work with local venues to cite the selected exhibitions. So while these shows were not put together by NCECA, they were vetted by NCECA. Because of this process, in recent years, NCECA chose to drop “independent” from the acronym, and we now mostly call these simply concurrent exhibitions or “CE”s. LGE is short for “Locally Generated Exhibition”. These were the term given to the shows that are created by various venues within the host region itself. These shows traditionally did not have any oversight by NCECA but were affiliated with the conference by proximity. It was extremely challenging to manage expectations and information, and somehow a show would inadvertently get overlooked, or information regarding open dates and times would not get updated. This year, we invited venues in the region who were mounting their own shows to submit these shows to a new process. The deadline was much later than the CE deadline and the form much simpler, but it gives NCECA with all the details necessary to provide the most up to date information to conference attendees in print media and the NCECA App. As an added benefit, these shows, now having been through a vetting process, will also be eligible to check out one of the new NCECA flags. Because they went through the same considerations as the shows the onsites help to cite, these shows are now also considered concurrent exhibitions (CEs). RSJE stood for “Regional Student Juried Exhibition”. Sometime before my board service, (so probably about 7 or 8 years ago), this was the annual NCECA-supported show that was organized by the Student Director-at-Large. It was open to students in usually a 5-6 state region surrounding that year’s conference. Because it was extremely possible that during a student’s education, that the conference would not be within 5 states of their institution. Therefore, during Jessica Orlowski’s SDAL term, the regional show was expanded to a national one in order to better meet the needs of the student membership of NCECA, and the acronym therefore changed to NSJE. 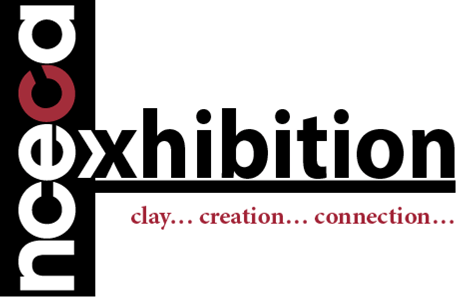 The NCECA Biennial evolved from the NCECA Clay National and NCECA Juried Member’s Exhibition. It fulfills a critical role NCECA’s mission by providing a vehicle for the membership to exhibit. The show is held biennially, usually during the odd numbered year. In even number years, NCECA mounts the NCECA Invitational – a show that has typically been co-curated by NCECA’s and the host venue’s exhibitions directors. HOWEVER, our current exhibitions director, Leigh Taylor Mickelson, has been working diligently on some much needed revisions to how NCECA manages its own shows, but I’ll let her tell you all about that in a future post. In the meantime, for the coming year, the NCECA invitational will be hosted at the Nelson-Atkins Museum of Art, and it will be FABULOUS…but again, more on that coming soon! Also, be sure to stay tuned here for more insider information the Concurrent Exhibitions, and the always popular Bus Tours and Shuttles! What Makes a Teabowl a Chawan - now online!